Yesterday I shared the highlights from the first part of our family vacation to Hilton Head Island, and today I will share a few more from the back half of our trip. And all this sharing is making me wish I could be right back on those sandy beaches. When we aren't beaching it seems like we are eating. Usually we frequent the same few places each year, and then sprinkle in some new ones to try. This year we planned a large family dinner since my whole family would be in town together for at least part of the trip. We had our eyes set on Live Oak, which we fell in love with last year, but sadly learned that they no longer offer dinner. So we switched gears and decided to try Links American Grill located in the Harbour Town Club House, which just happened to be a short walk from our rental. The food and drinks were yummy, and the service was excellent. I think my favorite part though was letting the kids take in all the golf memorabilia and letting them play on the golf course afterward. My little ones are nature lovers. They can tell you facts about animals I've never even heard the names of (Thank you Kratt brothers.). Alligators are everywhere on the island. They frequent golf courses, and most fresh bodies of water in Sea Pines. It's not hard to spot them, and as frequent visitors of the island we know how to spot them and keep to a safe distance. The Cutes think it is so fun though, and this year we thought we would sign up for an official alligator tour. We made reservations for in the morning, and as many times as I've been on the island I've never done one of these tours or stepped into the Sea Pines Forest Preserve. The tour is via boat, and takes place on one of the lakes in the preserve. It lasted right around an hour, and was perfect the length for our little ones age group. The guide was informative, and so knowledgable about all the wildlife on the preserve. So even if we didn't come across an alligator at any given time, he was quick to point out other animals, and share interesting facts. He was also kind enough to answer each and every question The Cutes threw at him. Including L.C. 's deep ones like, "Why are alligators alligators?" or "Why do turtles swim?". The Cutes were captivated each and every time we spotted an alligator, and I was amazed at how close we could get. It was hard to photograph, but we saw big alligators, small ones, and even new little babies. It was a fun tour, and the preserve itself is one destination we want to explore more on our next trip back. If you or your little ones love the outdoors or wildlife I would add this to your itinerary if you are on the island. And again, if we aren't beaching it seems like we are eating. Thank goodness for all that island bike riding and walking or else we'd put on twenty pounds with all the delicious food available. How I've never eaten at this next little gem is beyond me. CQ's Restaurant was by far our favorite meal of the trip. Mr. Cute and I were able to sneak away for a little date night our last night on the island (thanks family! ), and decided to walk to CQ's. The restaurant is located in an old historic home from the 1800's that belonged to the lighthouse keeper at the time. If you are into ghost stories, do a quick google about the homes history and the tale of The Blue Lady. As a restaurant though the atmosphere had a romantic historic vibe to it, and the food and wine were excellent. I highly recommend grabbing a meal or three here if you are lucky enough to sneak away for an adult only meal. 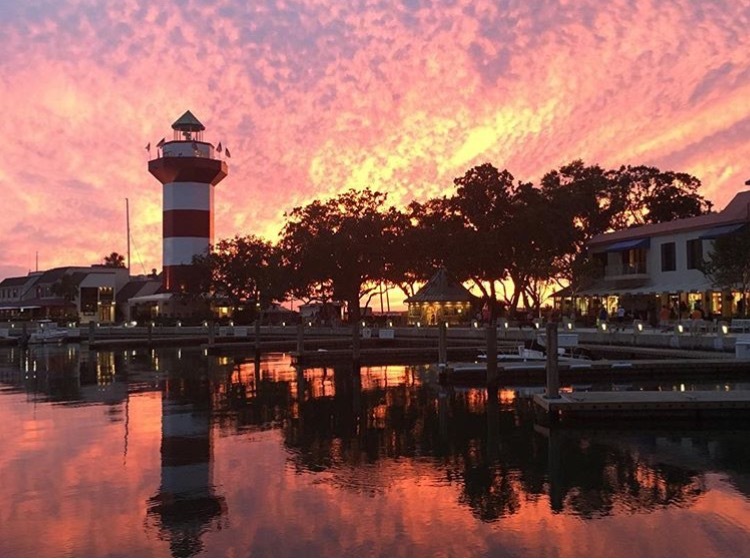 Have you been to Hilton Head Island? What are some of your favorite things to do, see, eat?